Currently viewing the category: "ICYMI"
It finally seems that ECOT is dead. Today the Ohio Supreme Court ruled 4-2 against ECOT’s appeal and sided with the state. This upheld lower court rulings and determined the state acted lawfully when it ordered ECOT to repay millions for unverified enrollment. However, the matter of collecting ill-gotten money from the ECOT Man and his two companies is still pending. The decision came with Chief Justice Maureen O’Connor, Justices Patrick Fischer and Mary DeGenaro and appellate judge W. Scott Gwin, sitting in for recused Justice Judith French, forming the majority. The fight for the special election in House District 12 to replace Rep. Pat Tiberi has seen its fair share of attack ads. This is especially true from Republican candidate Troy Balderson. Attack ads seem to be all the craze these days, so I think I can speak for all of us when I say that ads highlighting a candidate’s leadership abilities are refreshing. That is exactly what is done in Democratic candidate Danny O’Connor’s recent ad, ‘Shannon’. Bob Applebaum, Maple Heights School District Treasurer, spoke about the experience of Maple Heights with ECOT students at a June 6 Statehouse news conference conducted by Innovation Ohio. He is not quoted in a June 7 Columbus Dispatch article that covered the news conference, but his message is critically important. 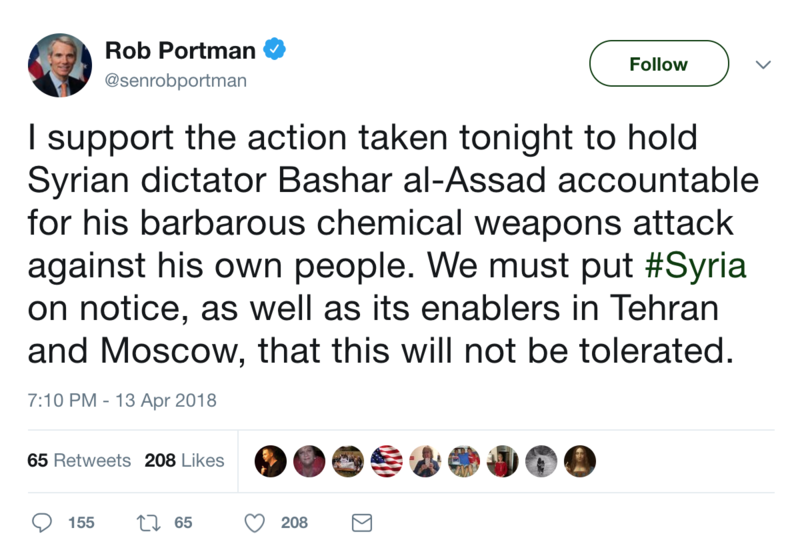 Following President Trump’s announcement that the U.S. will lead missile strikes against the Syrian regime under Bashar Assad for the use of chemical weapons, members of the GOP came out in waves of support. It seems these republicans forgot their previous stances. On April 9, the Ohio Alliance for Arts Education (OAAE) Action Alert provided a comprehensive rationale for opposing House Bill 512. The Action Alert includes some points of opposition that have not been highlighted up to now. Now that Don Blankenship is out of jail, the Republicans’ bid to win the U.S. Senate seat in West Virginia should become much more interesting. Blankenship, as you may recall, is the powerful coal baron who was imprisoned for a year for a safety breach at his Upper Big Branch Mine in 2010 that led to an explosion killing 29 miners. Senator Joe Schiavoni became the first Democratic candidate for governor this cycle to announce a running mate. His choice: Stephanie Dodd, Ohio Board of Education member. According to the campaign’s press release: Dodd has served two terms on the Ohio Board of Education, representing all or parts of 13 counties in Central, Southeastern and Appalachian Ohio. During her tenure, she has voted to return $60 million in taxpayer dollars from ECOT for inaccurate student enrollment. She also stands for less standardized testing to be required by the state, and in support of increased spending for early childhood education. Last week State Rep. John Becker unveiled the latest round of attacks on unions and Ohio’s working class, aiming to dissolve unions in both the public and private sector. However, Ohio AFL-CIO is fighting back with a fiery letter sent to all state representatives.